Nick opened up with a very interactive exercise, with some synchronised banana munching. It certainly makes a big change from loads of detailed powerpoint slides! The point? It is something that we will remember for a long time, and certainly much longer than we’ll remember a lot of the other things we encountered at the show. 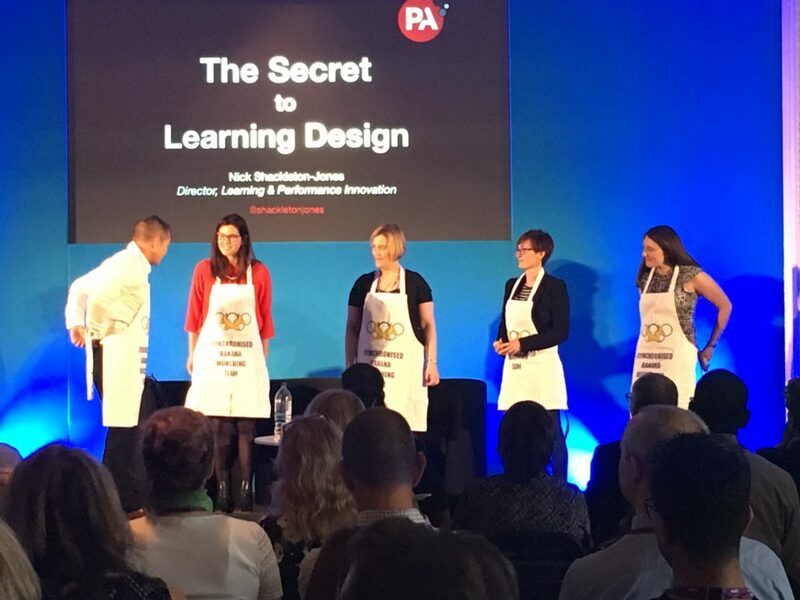 Making learning memorable is a real challenge and in order to achieve this, Nick suggests that we need to know how learning works. At the heart of how learning works; we don’t remember what happened to us, but we remember our reactions to it. Things with strong affective context (e.g. celebrity gossip) tends to stick, whilst things with weak affective context (e.g. learning theory) don’t. Whilst learning theory might stick for us learning geeks, it probably won’t for other people. When we’re trying to help people learn about something that they don’t care about, we need to help them care. One way of doing this is by engaging them in understanding the impact e.g. using Virtual Reality to create simulations of health and safety exercises will help people to care. In learning we can do two things; craft experiences (to help people care) and/or build resources (for people who already care). Nick described an approach to learning design which uses the principles of design thinking; it starts with a deep dive into the needs of the audience, working to uncover what they really care about and what we want them to really care about. This then gives the insights needed to create a minimum viable product (MVP) of the learning, which can then be tested and refined. There are loads of things we can do help; Storytelling is really powerful tool, but many simple techniques can work well; things such as checklists and glossaries are cheap to produce and can be impactful. BP have integrated all of their resources so that staff can access them via a smartphone app. People often worry about things that you might not even be aware of, but you can often address them with really low-cost impact learning interventions. One of the tools they use is the Concern-Tasks-Resources model. This starts with an understanding of the audiences’s concerns, before identifying the tasks that relate to these concerns , and then identifying the resources that might help the audience. This also involves thinking more widely about possible ‘interventions”; a training course often isn’t the best answer. Build resources, not courses. Nick showed lots of examples of resources; videos explaining how the business works, factsheets, checklists, videos with advice from people about making the most of your first 3 months in the organisations, factsheets on how to get started with your laptop, 20-second videos on topics. There was a real theme of creating things that meet the real need, rather than just dumping the training content that we have. The 5Di Design Process is about Defining the outcome, Discovering the concerns and tasks that underpin performance, Design helpful stuff, Develop in a user-centred way, Deploy MVPs rapidly and market them, and then iterate.